Fantastic stills, Estelle. Thanks so much for sharing them. I cannot wait to watch this video! It looks like they're getting their jeans signed. Now why didn't I think of that! The next set of images cracks me up!...Paul kept his tongue stuck out for a few moments on the video and looked thoughtful. Has Em seen these yet? Were they auctioning off the second Marwood coat, btw? (I thought I saw 'Christies' in the background there.) Do they mention what they got for it? Great caps, Estelle--I don't think you missed a frame! I'm really excited to see this now, too! And to think I just put 27 and 16 together a few weeks back, and realized he was 'Benvolio' in the 1968 version of Romeo and Juliet--and I used to drool over him in Tiger Beat magazine when I was twelve! I watched Franco Zeffirelli's production of Romeo & Juliet for the first time yesterday. Bruce was great in it. I do think he got a lot sexier with age though. I'd take Brian Lovell (his Still Crazy character) over Benvolio any day, and not just because of the tights! I watched Franco Zeffirelli's production of Romeo & Juliet for the first time yesterday. Bruce was great in it. Did you? Wow, I haven't seen that in over thirty years! He was actually good in it, huh? I was probaby too young to notice at the time ... I'll have to see if I can get that off Netflix, and take a stroll down memory lane. I do think he got a lot sexier with age though. Yeah, he was very 'pretty' when he was young, wasn't he? (Not unlike a certain scouse actor whom he later directed. ) Time has added a lot of character and rugged handsomeness to his face, I think. Paul was very 'pretty' when he was young, too. So much so, he won nearly all of the female parts in his all-boy primary school theatrical productions. There are a few pics of him and his brothers as young boys floating around--I always seemed to wind up posting them at the old Libraries--I suppose I should get them up here, too! Will do. Did you? Wow, I haven't seen that in over thirty years! He was actually good in it, huh? Perhaps I was being generous. A tad. Bet they've never seen the film. Good for publicity I suppose. Bruce Robinson was certainly beautiful in that film. The older Robinson reminds me of DeForest Kelly who played Dr. Leonard McCoy in Star Trek (and in some pictures of Paul as Mr. Bush, I'm reminded of Michael Palin). Oh, Marwood, I haven't forgotten your DVD and will mail it this weekend. I envy you for not being sure! (and in some pictures of Paul as Mr. Bush, I'm reminded of Michael Palin). Really Estelle? You'll have to point out which ones to me sometime. Well you can envy me even more for not having any clue whatsoever! lol Who are they? Mediocrely talented has-been publicity mongers who annoyingly show up at every photo-op event and leech off the auras of truely gifted performers, perhaps? First of all; Wauw Estelle, your talent for doing caps==> Don't hold it back, the caps are awesome!!! Teri; Posh and Becks are David -Becks- BeckhamVictoria -posh- Adams akka Mrs Beckham. He is Englands golden boy in football (Soccer) and she is a singer. She kind of 'made' him as in created the right image for him. They are very hot Europe. Kind of the golden couple with whom everything is shiny. (althoug it is never all sunshine and no storm in ANY marriage....) Well, now you know . Marwood, I haven't forgotten your DVD and will mail it this weekend. How long does it usually take for packages to get from the States to the UK? It hasn't arrived yet. I watched Franco Zeffirelli's production of Romeo & Juliet for the first time yesterday. Bruce was great in it. Smile I do think he got a lot sexier with age though. I'd take Brian Lovell (his Still Crazy character) over Benvolio any day, and not just because of the tights! I wonder if you can rent Still Crazy here??? I'll have to check that out.. 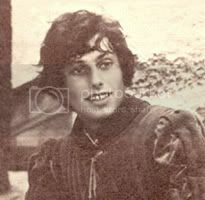 It didn't realize it was Bruce Robinson playing the part of Benvolio in Romeo and Juliet. I've seen that film quite a few times over the years....You learn something new every day! part of the BFI Modern Classics collection. While giving a bit of a synopsis of the film, it also gives some of Bruce's own experiences at the time. It's not a big book but it's a fascinating little read nonetheless. In all, over 100,000 pounds was raised at the auction and the proceeds were going towards an educational fund in Grant's hometown of Swaziland.